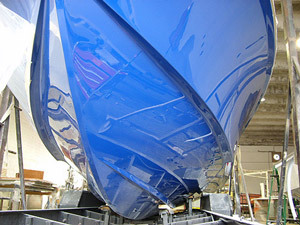 ﻿ Typhoon Marine - Custom Boats Taking the Industry by Storm! Long used as a technique with racing yachts, when running, anytime you reduce the wetted surface area, you automatically reduce the drag and increase efficiency resulting in higher speeds with less horsepower and less fuel consumption. There is no comparison. Less wetted surface area and less drag equals a dry, smooth ride. Our new sophisticated manufacturing techniques ensure the integrity of the hull at even the highest speeds, while minimizing the maintenance and care.